I have not read any of George R.R. Martin's newly-released A Dance With Dragons, though I did have the pleasure of handling a copy in the store this evening (they redid the map!). My copy is still en route, and should be here in a couple days. It is all well and good, since I have yet to complete my reread. [ ]I must profess that I am disappointed by the cover art. The first three novels in their first editions had great cover art - an illustration of an actual scene from the novel. But starting with A Feast for Crows and continuing with the new release, the cover is more abstract, which is not my taste. Perhaps one day there will be a new edition which has Stephen Youll illustrations as cover art for the entire seven novel series. A fan can dream. There seems to be a lot of excitement about the "Game of Thrones" HBO miniseries among the common folks. I have not seen any of it and probably never will. I must confess that I feel somewhat smug to have read the series before the show aired. Why does the show omit "A" from the title of the book? The world may never know. It doesn't matter, but it bugs me. 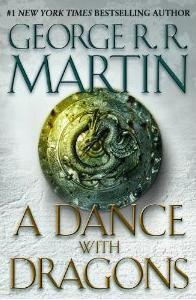 I am also bothered by A Dance With Dragons being referred to "the latest 'Game of Thrones' book." 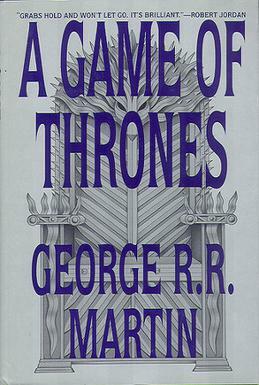 If there is one thing I am thankful for regarding the series, it is that it has refocused Martin's attention back onto A Song of Ice and Fire. Perhaps it will not be so long a wait for each of the final two novels in the series. A fan can dream. [ ]Now I must stop my griping and profess my excitement. This is my first new release since becoming a fan of the series, and I can hardly wait to start plowing through the new novel. I am sure it will not take me long. I promise to not spoil anything, at least not for quite some time. It is difficult for me to describe why A Song of Ice and Fire is so phenomenal. I will confess that Martin's writing is not the best. He seems to be more interested in spinning a good yarn than constructing a good metaphor. And the books are of course rather crass at points. However there is something great in the telling of the story. Somehow Martin has constructed a story that is massive in scope, yet intimate in character and plot. That keeps me reading hungrily and keeps me from noticing any authorial foibles which some critics like to point out. It is a good story, and I like reading it.